This was knitted by fellow Bonder Gene Ortloff from Binghamton, NY, using the pattern with 121 sts and keyplate 2. Yarn is Silk City 3/2 perle (mercerized) cotton which comes on a cone of 500 g/1,386 yds. It took about 1 1/2 cones of ecru. 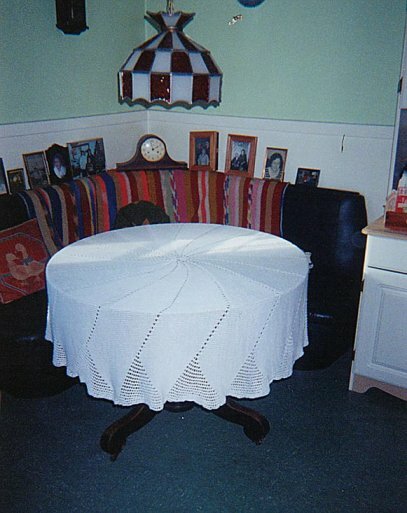 The tablecloth turned out to be 70 inches in diameter, the table in the picture is 42" in diameter. Thanks for sharing the picture and helpful hints, Gene, I think it turned out real nice! I asked if there were any problems with getting the tablecloth to lay flat and here is what Gene said: "I hate to iron, so I washed it in a net bag you get for delicate items. Took it out of the bag after washing and put into dryer until just a tiny bit damp. Put it on the table, smoothed it out with my hands and let it finish drying there. You want to use a light touch or stitches will stretch in the direction you are smoothing. And you want it almost dry."